I finally finished the queen-sized quilt I have been wanting to make for my daughter. 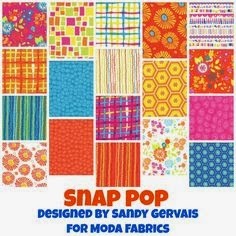 My son got one when he was two but I didn't have just the right one in mind for my daughter until a girlfriend and I went to a quilt show and I found the most adorable jelly roll of Snap Pop by Moda. She told me that she had the matching charm pack so I got both and was on the search for a pattern. it to be something that could grow with her into her tween, teen and young adult years. She has such a vibrant personality that I wanted the colours to showcase this. I also personally wanted to try my hand at a more modern style and colour for a quilt. 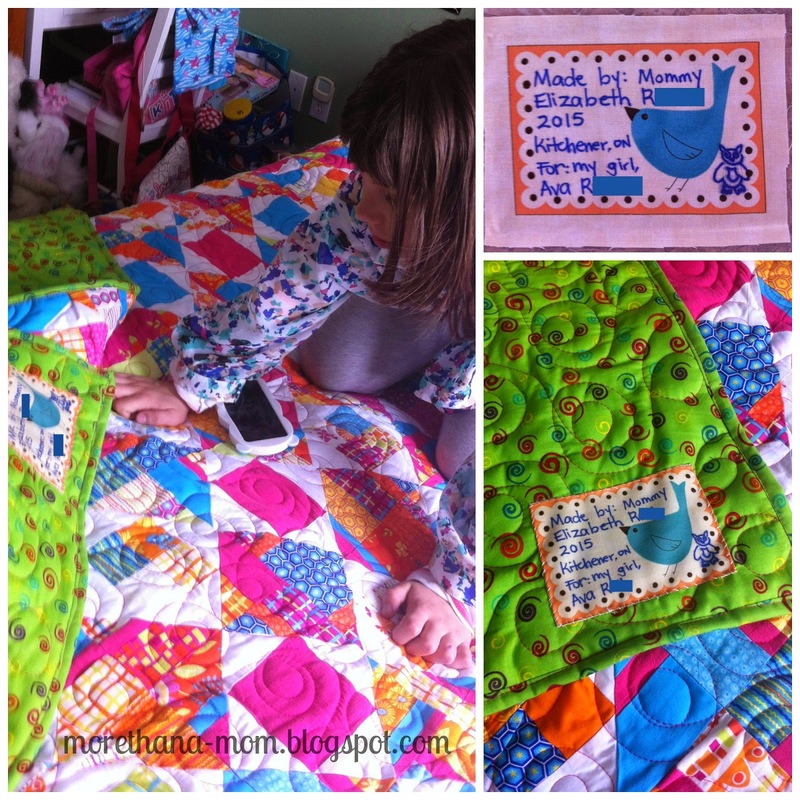 The pattern I used is called "Nash: Small Quilt" by Miss Rosie's Quilt Co., found in the Schnibbles pattern book. For the backing I considered using flannel but my daughter is so hot in general that I felt a cotton would be cooler - especially as I planned to use two layers of batting. I used one layer of bamboo and one layer of polyester mid-loft. I love the effect after it's been washed. The negative space really pops! When shopping for the batting I found a lovely sheeting in tones that matched the Snap Pop collection. 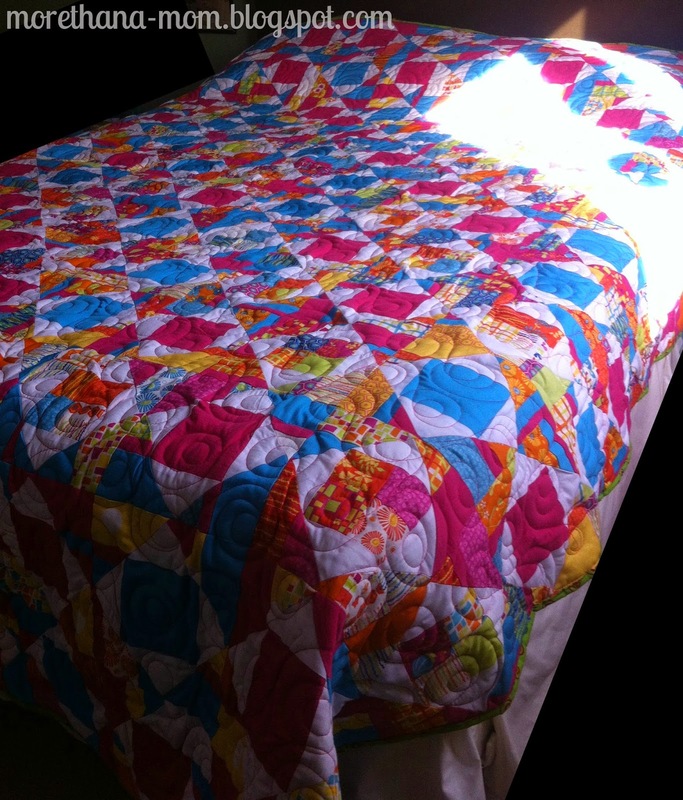 I really liked the swirls on the backing so I matched my quilting pattern to it and used "Mod Dotz." I used a hot pink thread to make the swirls pop. Below is the girl checking out the label I made. It may not show in this photo but she was super excited to see our names on the quilt. The hand drawn bottom right item on the label is an owl. 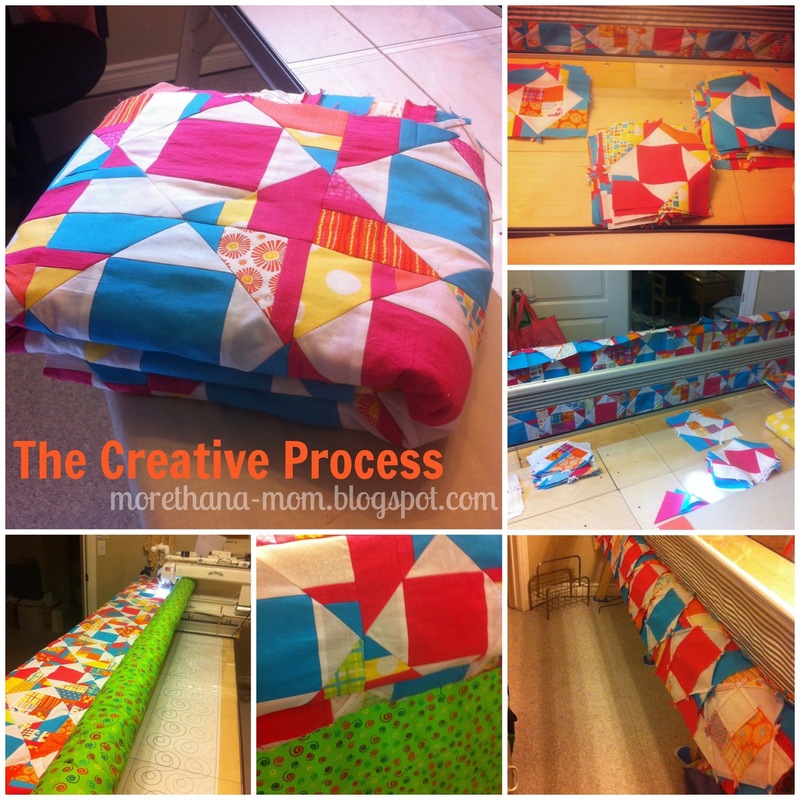 I added this because my quilt guild has a challenge that if you enter an object you want to finish before the guild year has ended then you are entered into a draw. If you have an owl on it you get an extra entry. OWLS stand for "Our Wonderful Leftover Stuff". I am so happy to have presented this at the guild meeting and to have completed my goal to get this done! I love the final product! The girl loves it too. Now I'm thinking we need to paint her room a colour to flatter the quilt.